Last year I decided that I wanted to learn and use CW. To that end, I enrolled and completed the CW Academy Level 1 class with the CW Ops group (http://www.cwops.org/cwacademy.html). I have 2 CW QSO’s under my belt and I need to get on the air and make some more. Ion preparation for that, I decided to get the 500Hz CW Filter to add to my FT-857D. The radio has two slots for optional filters. 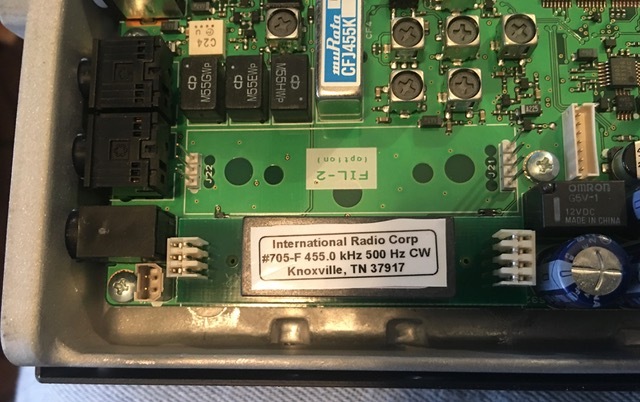 Looking online, it seems the filters for the FT-857D are getting harder to find. I found one on INRAD’s web site and ordered one. It came a few days later and sat on my desk for a couple days. being Saturday and getting some things done, I decided to install it. I found it’s really very easy to install this filter. 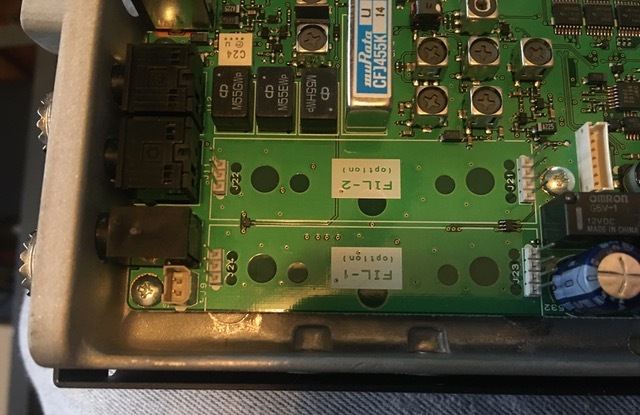 To start with, there are 7 screws that hold on the top cover of the radio. 2 on each side and 3 on the top. The labels are simply my way of remember where things go in the back of the radio while it’s in my portable rack. After removing the cover the locations for the filters are in the back left corner, as shown in the lower left portion of the photo below. The filter is pretty easy to orient. There are 3 pins on one and and 4 on the other so it’s hard to get it backwards. There was also a reminder from INRAD that the circuit board went down and the label faces up. Here is after the installation which is simply pressed in. After the installation, I wanted to make sure it was recognized by the radio so I powered it in and looked at the filter menu option and the 500Hz filter showed up as option B. Now all I have to do is get on the air! When I do that, I will try to remember to make a video demonstrating how the filter affects reception of CW signals. 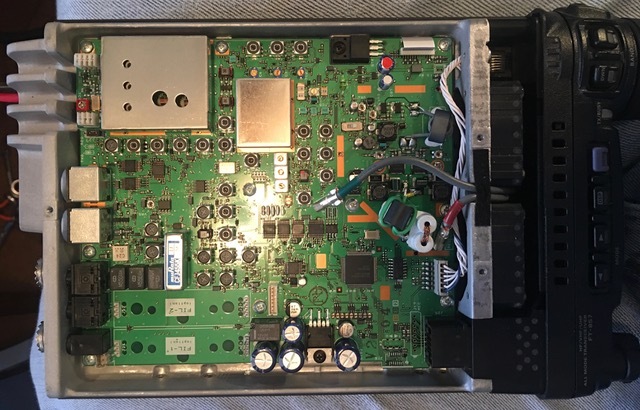 If you have a FT-857(D) and would like a CW filter for it, you might put this project on your list. I can imagine a day when these filters are really hard to find! 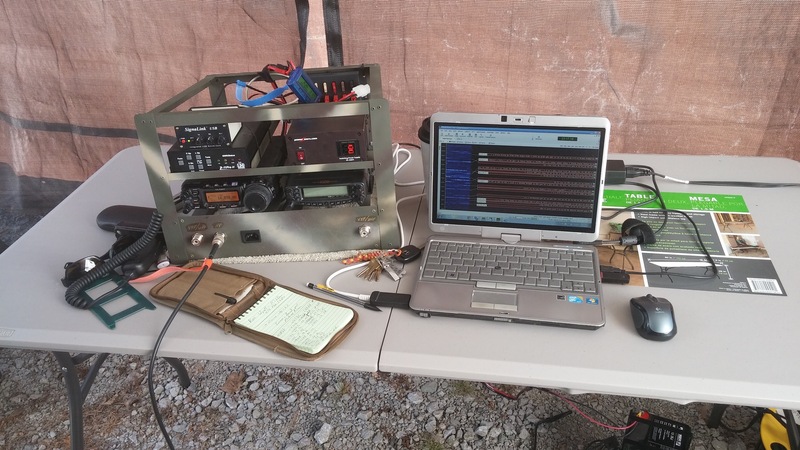 The last few years, I have been using an old hand me down laptop for my ham radio activities. The old one had little memory, the battery that didn’t last very long, was starting to boot unreliably, even after a Windows reinstall, and a few other issues. So I bought an open box Dell laptop at a discount from a local retailer. It has 8GB of RAM and a 1 TB disk drive and i5 processor. While it’s not a top of the line laptop, it’ll work for what I have intended. Also the screen isn’t the highest resolution but since it’s dedicated to ham radio usage only it won’t be a problem. My main goal with this project is to use Linux more for my ham radio activities. I now work professionally in the Linux world so I would like to carry that experience into my ham radio hobby. 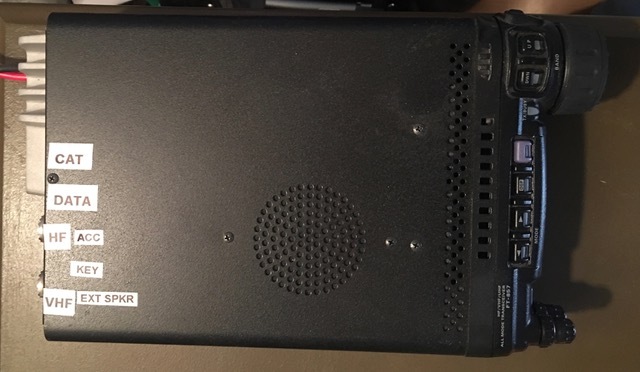 I am setting this up as a dual boot system, keeping Windows 10 that came on it, and then installing OpenSUSE Leap 42.2 as my Linux distribution. I know Ubuntu seems to be the most popular distribution, but I am most familiar with SUSE Enterprise Linux, so OpenSUSE draws on that experience. I run openSUSE 42.2 on my work laptop on a daily basis so I am very familiar with it. I thought I would post about the steps I am taking to achieve this so if anyone else decides to do something similar, I will have shared what I went through. 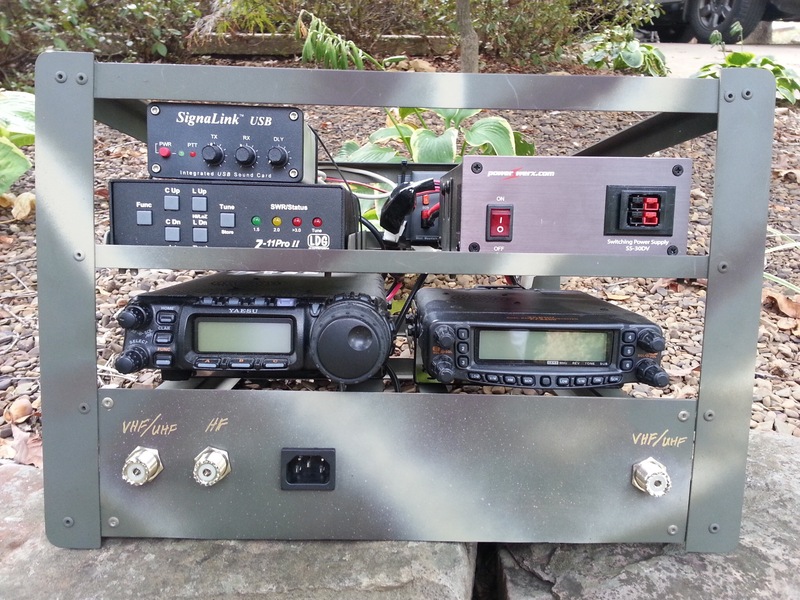 I will try to follow this up later with posts about using various Linux applications for ham radio like CQRLog, WSJT-X and other things I find useful. I will use the Windows install for a few things. My old ham radio laptop was running Windows so I can duplicate it’s capabilities if needed. One of those jobs is some Windows software that I bought from RT Systems for programming my radios. I’ll eventually investigate Linux alternatives such as Chirp but that will be low on the priority list. Boot into BIOS/uefi and disable Secure Boot. I don’t need this. Boot up Windows, create use﻿r account, and fully make sure all updates are installed, and any initial setup. Make a Windows 10 recovery USB thumb drive. This is built into Windows 10. Download the restore image from Dell to restore the laptop if needed. Run the Windows Disk Cleanup utility to remove all unneeded files including any previous version of Windows left behind after the updates, and all update related files. I check all the boxes in the cleanup utility including system files. Use diskmgmt.msc to shrink the main Windows 10 partition to about 450GB. That will leave about 430GB of free space to use for Linux installation. I had to disable system protection, pagefile and hibernation in order to get the drive to shrink to where I wanted it. These are unmovable files and might hamper the ability to shrink the disk. After shrinking, I reenabled all of those. VERY IMPORTANT STEP: Use Clonezilla to make a complete cloned backup of the entire disk drive so I can put Humpty back together if something bad happens or I make a mistake. This will backup all the partitions to a set of files on a USB drive, and allow me to completely restore the drive and partitions. I now have 3 ways to restore the system. Clonezilla backup, restore image I downloaded, and the Windows Recovery thumb drive I created. Install Dropbox as I’ll use that to transfer some things from the old laptop to the new one. BACKUPS are very IMPORTANT as is the ability to UNDO something even if it means a full restore. NOTE: Clonezilla doesn’t backup empty space to the resulting backup is smaller that the drive that’s being cloned. Now it’s time to install Linux. I made a bootable thumb drive from the openSUSE Leap 42.2 iso. This was done using dd on my work Linux laptop. The website to download openSUSE from is: http://www.opensuse.org. There are two openSUSE distributions. Leap is a point release and Tumbleweed is a rolling release and always at the bleeding edge. If you want something stable then Leap is the way to go. It’s also what I run on my work laptop as my primary OS. I booted from the Leap thumb drive, and went through a normal install. From the free space I created by shrinking the Windows partition, I made a 4GB swap partition, a 50GB / (root) partition and assigned the rest of the space to /home which is where all my data will reside. When Linux is installed, it installs the Grub2 bootloader which is able to detect Windows 10 and make it a selection at boot time. When you boot the system, a Grub2 menu will display allowing the choice of which operating system to boot. You can also choose which one boots as default when the grub2 timer expires. One thing I found . . . When I booted back into Windows, it assigned drive letters to the Linux partitions which is something I did not want. I started up diskmgmt.msc in Windows and removed the drive letter associations from the 3 Linux partitions. That way Windows won’t mount the Linux partitions and possibly cause an issue. cqrlog & mysql – Popular Linux Ham Radio Logging program. I exported my log from HRD (ver 5.24) on the old computer and imported it into cqrlog. tqsl – I made a backup of my certificate using tqsl on the old Windows computer and was able to restore it using tqsl on the new Linux installation. One last thing before moving on. I took another Clonezilla backup of the entire laptop drive. Now I have two Clonezilla backups and could restore either one if I desired. Just a note on Virtual Machine vs Dual boot. I use VM’s daily on my work laptop and my other personal laptop so I am very accustomed to their use. On my work laptop I run Linux full time with Windows 10 in a virtual machine along with about 10 other Linux VM’s (not all running at once). For the ham laptop I wanted two things. To run Linux as full time as possible for my ham radio hobby, and for the operating system to have direct access to the hardware without the virtualization layer in the middle.